So basically OMG! I just caught my first queen ant of the season, and this might be my first colony since my past queen ants were all social parasites and never started colonies. I really need help identifying this queen, care tips would also be nice too!!! 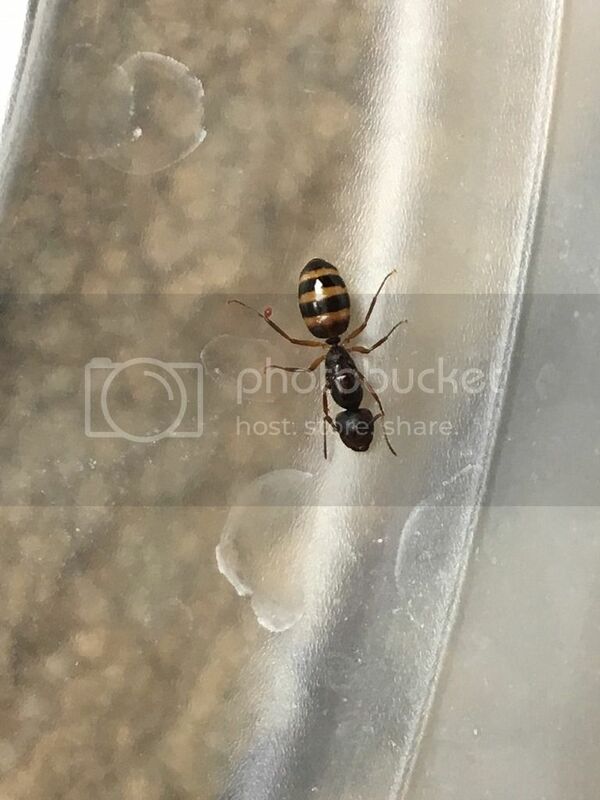 I don’t know for sure if it is a Camponotus atriceps because I live in Indiana, and Wikipedia says they are native to South America, and it just doesn’t quite look like my queen ant, I may very possibly be wrong though, any thoughts??? Well 1st keep her away from your other ants. See the mite on her leg? She looks just like my Camponotus subbarbatus see my journal if you would like. I am 100% sure these are in your area. Don't forget the measurements! It's the rule! GREAT NEWS!!! While I was trying to get the mite off, it just randomly fell off sometime in the process, NO MORE MITES!!! And the queen ant is about 6mm I think, I’m not too good at measurements, lol. That's way too small, but that definitely means she is Camponotus subbarbatus. Awesome I thought so!!! Great to hear she dropped the mite. Mine did the same, I too had the same exact mite problem. The red color is because those mites are like ticks blood suckers.